The Papua New Guinea Olympic Committee donated five boxes of bed sheets to the Port Moresby General Hospital today (Friday 1 April, 2016) as part of its support to the community. The presentation was made by members of the PNG Athletes Commission, Linda Pulsan and Francis Kompaon. The brand new sheets are extras from the 2015 Pacific Games after distribution to Team PNG at the athletes Games Village. 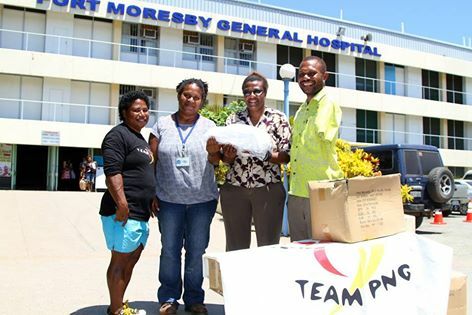 The PMGH also served as the emergency referral hospital for the Pacific Games and the donation was a fitting gesture to recognise the wonderful work the hospital played during the Games and continues to play for the nation. “The hospital needs all the help it can get to care for our people and we hope that these bed sheets can contribute to that in some way. “I would also like to encourage all the patients in the hospital to be strong and have faith that they come here to get well and go back home again – while they are here these sheets can help to keep them comfortable while they recover,” said PNG’s Powerlifting world record holder, Linda Pulsan. Project Officer Corporate Services of PMGH, Shirley Iewa said the donation is a bonus for the hospital and will go a long way in helping them care for the patients. “Care for the patients is the main goal of the hospital’s service and the donation of these linens is a big bonus and we really appreciate it,” Iewa said. She said PMGH is the biggest referral hospital in the country and they welcome such support from the community and the corporate sector. PNG Paralympic silver medalist, Francis Kompaon said the PNGOC through its sub committees such as the Athletes Commission run a number of community programmes and this was one of them. “As the country’s elite athletes, we represent our people so if and when we can we are happy to give something back to the community and this is one way to do that so I’m happy and feel really good to be doing this,” Kompaon said. PMGH has 961 beds and every day bed sheets and covers need cleaning. These are cleaned at the hospitals laundry department which houses one 35kg and two 50kg washers and three dryers. The demand for new and clean linen at the hospital is high and more washers and dryers are also needed to cater for this.